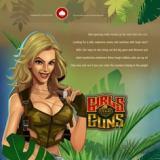 One of the biggest and best casino sites around, the massively popular 32Red Casino is famous for its huge selection of games and thrilling offers for players. At the time of writing, one of their best offers is for a free tenner when you sign up. Claiming your free £10 bonus is no problem at all. You just need to register on the site as a new player. Once you log in for the first time you will see a message offering you the chance to claim this money. Just click on it and you will be taken to the instructions for getting this money instantly without making any deposit. If you are happy with everything that you see on the 32Red Casino then the good times can start to roll. Even better news comes when you go to make your first deposit to your new account. In this case, you get handed a free £32 for every £10 of your own money that you deposit. 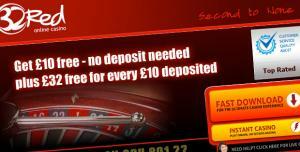 Once you have your free tenner you will find a brilliant selection of quality slots and table games on here. Give a few of them a try and then you can also claim a bonus of up to £160 when you decide to make your first ever deposit at the 32Red Casino.